What did you do this weekend? This is what we did! In our neck of the woods this is what we enjoy doing with our free time. Making a lot of noise in the woods in the freezing cold. Seriously though, it was a blast! My granddaughter got to shoot the .22 rifle she got for Christmas for the first time. It took a lot of coaxing and a bit of bribery to get her to take the first shot. After that she kept begging for more ammo, which she so charmingly calls “gunlets”! My husband and daughter got to shoot their brand new AR’s and then every other gun they own as well. After spending the day in the woods we came home to warm up. I love coming home to a clean home that welcomes us! Earlier that morning, before we headed off to brunch and shooting we took a few short minutes to do our morning habits that ensured we would be returning to a clean and comfy house later that day. We won’t talk about the mud my hubby drug in on his boots when we got home ….. Morning habits are key to a Self Cleaning House! Ten minutes tops to be able to come home to a clean house! We were cold when we got back and hubby had started to feel a bit under the weather. I decided to make my homemade chicken noodle soup for dinner. I made mention while I was making it that I don’t have a recipe. I just have it in my head. This makes my girls crazy. 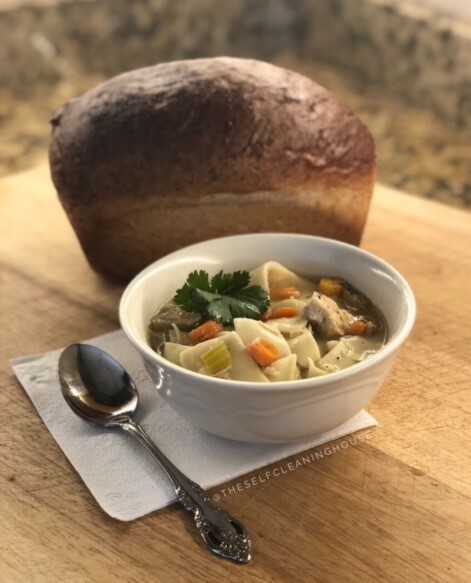 So I have been challenged by them to write my recipe for chicken noodle soup and share it with you! I hope you enjoy! In large Dutch oven melt butter. Sauté onion, garlic, carrots, celery, basil, bay leaf, salt and pepper until vegetables are softened. Add 4 cups of the chicken broth and bring to boil. Add noodles and chicken and reduce heat to medium. Stir often, add more chicken broth as necessary. Turn off as soon as noodles are cooked.